Alexander Vladimirovich Varlamov was born on June 19th, 1904 in Simbirsk (now Ulyanovsk) in a musicians and actors family. 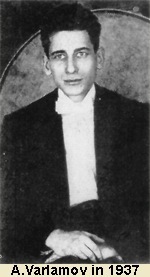 One should note, that some celebrated representatives of theatrical and musical professions were also among his ancestors: his great-grandfather, Glinka's contemporary A.E.Varlamov, a famous Russian composer, and one of his grandfathers - K.A.Varlamov - a well-known actor of St.Petersburg Alexandrine theatre. The future jazzman's mother was an opera singer, so such a heredity told much on young Varlamov's choice of profession. In 1922 he entered the Moscow GITIS actors faculty, but his attraction to music appeared to be stronger as in 1926 he leaves the previous place for the Gnesins musical college. That was just the time of Jack Wilters' jazz band tour to Moscow, and Varlamov visited one of its concerts. He had already became familiar with Parnach's jazz style before. And as a result he began to pay much more attention to new musical instruments, principles of jazz arrangement and playing manner, in a word, was really captivated with jazz. 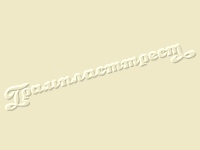 In 1930 Alexander Varlamov organized the "First modern variety vocal quartett" ("Pervokse" in Russian abbreviation). The posters announced "musical humouresques, songs, satyre and news of the day" being in programme. Successfully finishing his study, Alexander Varlamov receives a conductors' diploma and assembles an instrumental band which performed first time in 1934 at the Moscow Red Army park' Green theatre after 14 month rehearsals and was a huge success. Note that Varlamov's orchestra specialisation at that time were various tangos, what could seem a bit strange. Soon, however, the ensemble changed radically, as trumpets, trombone, and saxophones were added. The new collective played music of foreign composers as well as dance pieces created by the bandleader himself. Celestine Cool, the black singer then working in the USSR, became the soloist of the first orchestra's programme. Varlamov composed the "Yellow Rose" waltz-boston and "Lullaby" rumba exclusively for her, and, supplied with suitable English texts, they were immediately put on a disk in 1934. High professionalism, good taste and musicality marked Alexander Varlamov's jazz unlike many of its contemporaries. Within the big band the smaller collective, which one can now call the soloists ensemble, was organized. The first Soviet jazz improvisators showed their art there - saxophonist A.Vassil'ev, P.Boriskin and V.Bykov, the trumpet-players, O.Khvedkevich, the drummer. In 1938 the septet made a series of records, where jazz was treated in a virtuous manner similiar to this of Nat Gonella and Joe Donaldson bands in England, or "Hot Club de France" jazzmen groups in pre-war France. These recordings, particularly "Sweet Sue" , "Blue Moon" , "Waltz" , "Dixie - Lee" , "At the Carnival" became the classical examples of Soviet jazz' brilliant era. Also in 1938 the whole orchestra visited the recording studio with a number of Varlamov's own compositions and foreign pieces in his arrangements, such as "Wee Hours" , "Happy Journey" , "The Evening Passes By" , "The Life Is Full Of Joy" . In a half of them the bandleader's voice is clearly heard. But not a word about the singer's name was noted on the record labels. The cause was Varlamov's own wish, as he regarded the voice as an instrumental colouring, never considering its inclusion in a dance composition being an important thing. 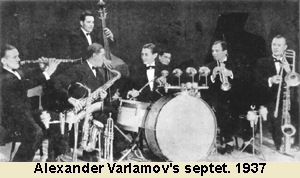 Alexander Vladimirovich Varlamov became the first leader of the All-Union Radio Commitee' jazz orchestra in 1938. Only two recordings of this orchestra were made at that time: "Jolly Hour" (P.Tomlin), "Dancing Fingers" (R.Rogers). He had created the superb orchestral groups, learned them to play complicated swing passages and riffes, did his best to reach a refined sonority balance. He passed on an experienced collective that had already achieved a good ensemble to his successor A.Tsfasman in 1939. An original, intonationally new type of jazz music had been worked out under Varlamov's leadership. It was here where the new musical thinking has taken its first shape, forming a true basis of the quite new playing style developed by the new generation of the Soviet jazz musicians of the 1950s. And if one is going to appraise Varlamov's orchestal art, then his main desert is that he had laid the fundament of the Soviet jazz-performing school. Alexander Varlamov was also busy with jazz studies with amateur musicians. In 1939 he had trained a jazz band of Moscow Bauman college students, that appeared to sound so fine, that it was invited to play at the "Nationale" cafe, known for its high musical reputation. Varlamov gave much energy to the further development of the USSR State jazz orchestra, and who knows, what heights could have been reached by this collective, if there were no war... These four sides "The Whistle Is My Work" and "A Dream" from the cartoon "Snow White And Seven Dwarfs", also "Halopp" by Isaac Dunayevsky and "Lyrical Song" from the film "The Hearts Of Four" recorded during the band's rehearsals of the new concert programme that was expected to be presented in July 1941 can prove it. Preparing to move to the North Front, A.Varlamov organized the "Melody-orchestra", that consisted mainly of bow instruments, also including two pianos and a drum section. As Varlamov himself had noted, that was the best band he had ever led.